Decorators Delight!! April Dates Avail!!! GULF FRONT, YES WE ARE DIRECTLY ON THE BEACH!!! To Inquire about our Special Discounts please contact us at: Cothee Wolf*Owner@334-657-1879 Our condominium is the place for you! A spacious balcony extends from the living area in this third floor Condominium with 'Perfect' views of the Gulf of Mexico. Every detail of our condominium is so exquisitely decorated. When you open the door, you will say 'WOW!!!' You will love the charming Tropical Decor and once you have stayed here, you will want to stay again. We very much enjoy vacationing at our condominium, so we have furnished it with everything to make our family, as well as yours, feel right at home!As local residents, we see to it that our condo is in great condition at all times.This is not your typical beach condo rental found with most rental companies.Stay with us and have a GREAT vacation! This is a great condominium for couples or a small family. Beds include one king-size in the master bedroom and two crew bunks in the main hallway (pocket door for privacy). There is also a queen-size sofa sleeper in the living area. The condominium will sleep up to six comfortably. * ADULTS AND FAMILIES ONLY. * NO STUDENT RENTALS-MUST BE 25 YEARS OLD! * SORRY NO PETS (local kennels available). * $110 Cleaning Fee (not included in rates). * Taxes not included in rates. * $200 Reservations/Security Deposit (Refundable after inspection). We are the Wolf Family. 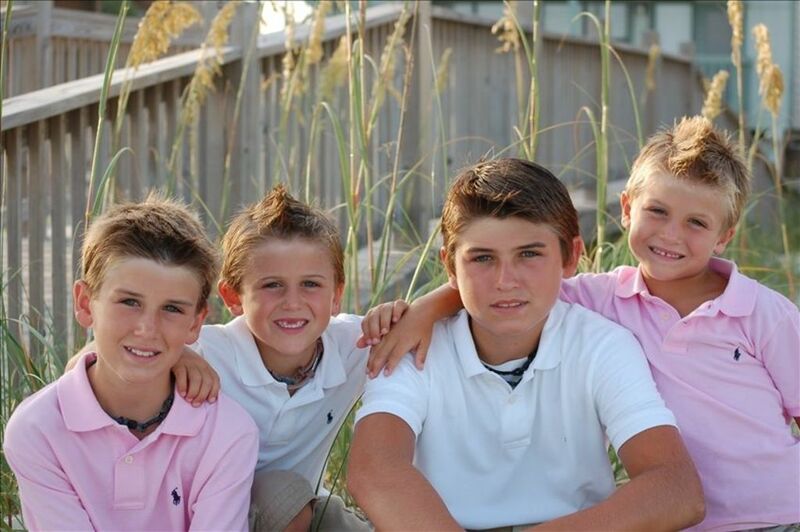 Jody, Cothee, Cody, Camden, Carson and Cole. We loved going to Gulf Shores so much. We decided to have our own place. Now we have four active kids so we cant spend as much time there as we would like. So we decided to rent it out and share it with others. My family loves playing in the sand at the beach, swimming at the pool, shopping at the outlet malls, eating at the SHRIMP BASKET and just relaxing and making family memories. Great condo with the perfect location it was furnished with everything we needed and the view can't be beat. The owners were great to work with and we will try and stay here again when in the area. The condo was great! Everything worked and was very comfortable. Location is perfect, and this may be the only building with a restroom at their pool. Highly recommend it. Cleaning was not up to my standards (dirty floors & rugs) not owners fault but they need to talk to cleaning agency. And the owner didn’t respond when I sent this to them. Which tells me they could care less about our concerns. Which is what prompted me to give this review. We really enjoyed our stay at the condo. It is beautifully decorated and well maintained. Very nice condo, great views, great food, and great beach!!!! Condo was very nice and amenities were adequate. Within walking distance of anything you might need. Lots to do in the area and the beach was amazing!!! This place was amazing and I will definitely be booking here again in the future. Beautifully decorated with an amazing view of the beach from the balcony..it really helped make my trip more enjoyable even though the weather was bad for most of the trip.